sodapep2 wrote: Making progress. Right in the middle of busy season (harvest), so it's slow but it's getting there! Is the harvest season over? Just checking on progress. .... Or, is this a dead subject? Ohhh nooooo!!!!! dead subject!! please noooo!! anybody make a PCB for this please? please!!!!!!!! Harvest season... are you in Northern California or... Iowa? Govmnt_Lacky wrote: Stick a fork in it! OHHHHH milions of pins on it like an ERIZO!!!!!!!!!!!!!!!!!!!!!!!!!!! PLEASE somebody do it?? thanks for your time!!!! 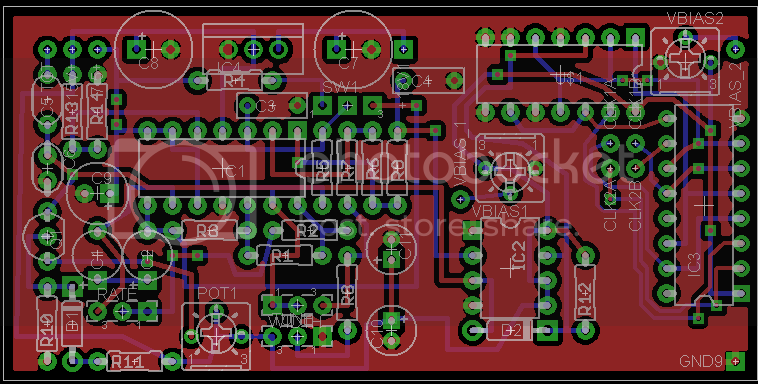 Oh right, I was making a PCB for this wasn't I? Now that things have died down, I will begin again! agoldoor wrote: Harvest season... are you in Northern California or... Iowa? I am in Northern California - a grad student at Davis working with tomatoes. 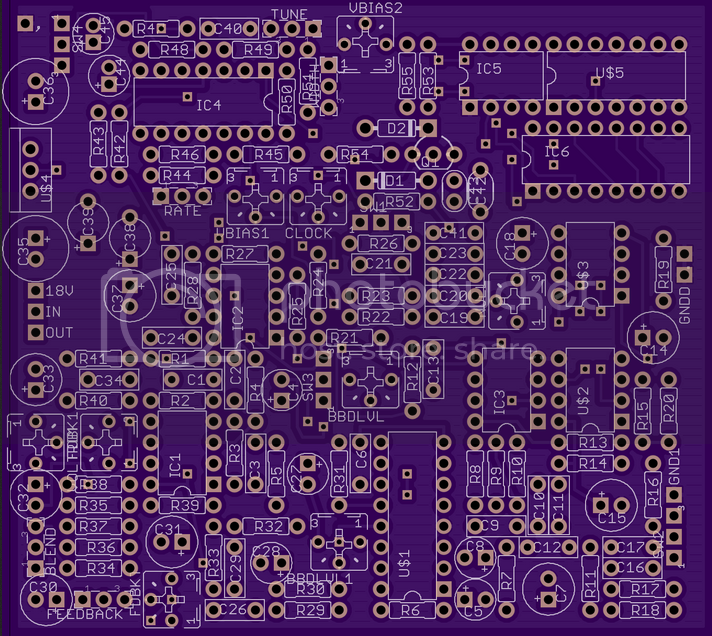 sodapep2 wrote: Oh right, I was making a PCB for this wasn't I? Now that things have died down, I will begin again! OHHH!!! goodness I was thinking you don´t make it anymore!!!!! Please the FORCE IS WITH YOU!!!!!!!! please man plesase!!!!!!!!!!!! So I've got a unit for calibration. Replaced all elcoes, converted the unit to 220v. DJGlukBH wrote: So I've got a unit for calibration. Replaced all elcoes, converted the unit to 220v. Anyway, it's a large circuit. So large I split it up between two boards. 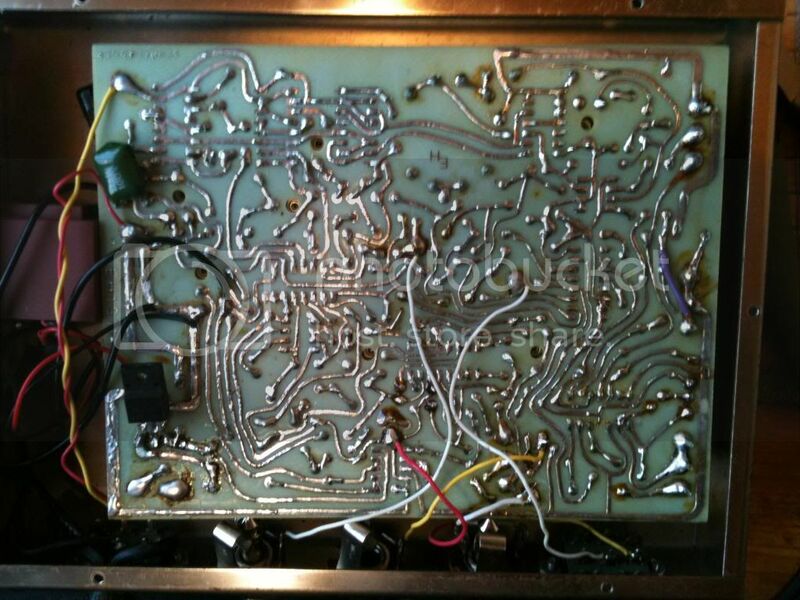 The neat part is is that the connections between the two boards line up so that the oscillator/power pcb lines up on top (or below, however you want to put it) of the larger, audio PCB. So you can just connect the two with headers. 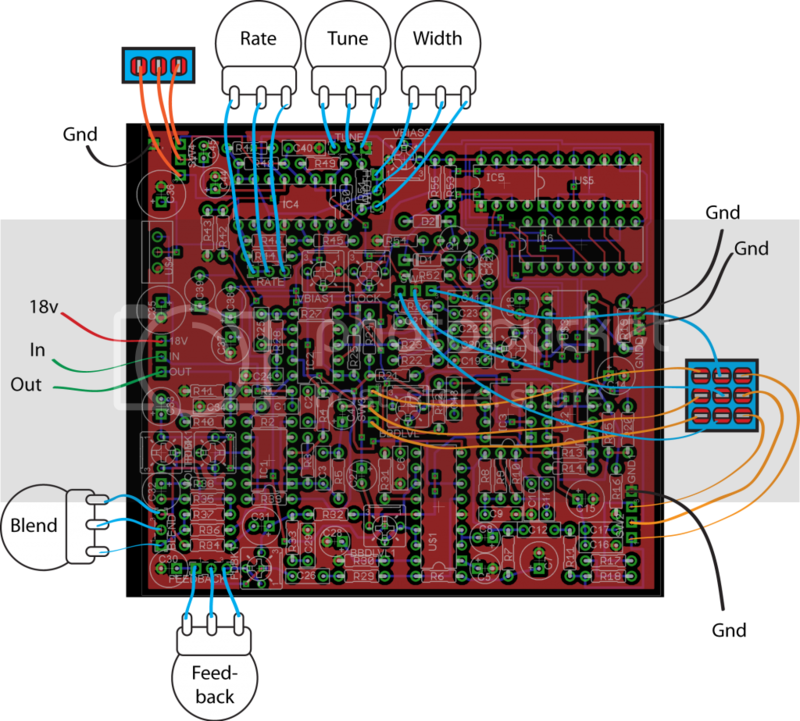 The Osc/Power board doesn't have the space used up as nicely because it needed space to line up with the corresponding connections on the other PCB. Like a poor-mans 4-layer PCB haha. I tried to make the off board connection sites as close to the outside as possible, but I also was realistic about space requirements. Should (!!!!) be able to fit into a 1690 (the taller version of the 1590). Depends on capacitor height and whatnot. I haven't posted a schematic/values yet for evaluation because I simply haven't had the time. Work work work! Awesome! Hopefully someone will make some boards up when all is finished! 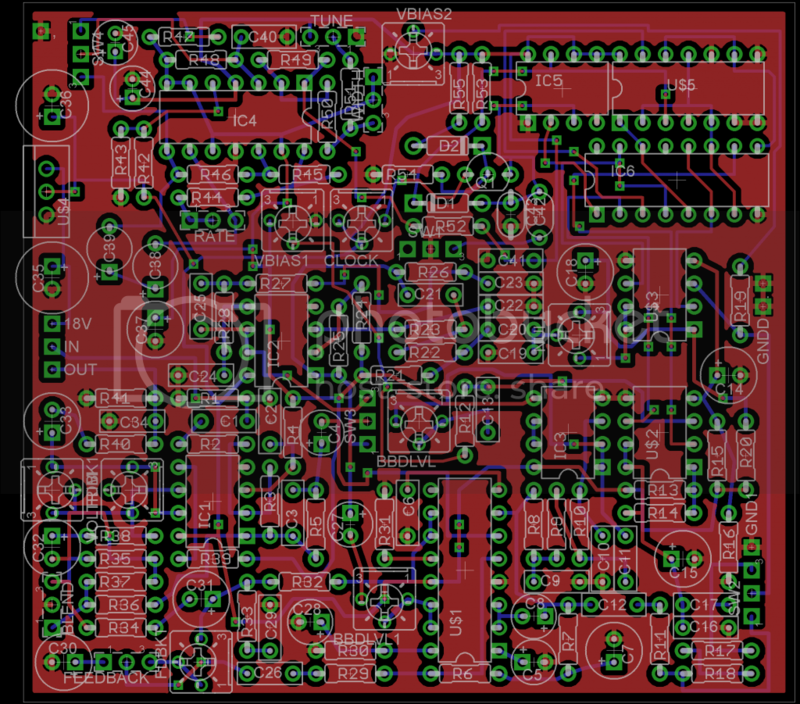 I usually get more boards through DorkBot, so they come in triplicate. If the primarily boards end up alright, I'll let the other two go to some of you guys! If it takes off, I can do a little run of them as well. That's a bit in the future though. In the mean time, does anyone have any mod ideas? Through-zero flange was mentioned. There's a cool chip out there now to control 4047's with memory recall and whatnot from Molten Voltage that could be cool. Throw any ideas at me! I haven't moved the values from Nelson's schematic to mine yet, so I haven't posted, but it is the MN3007 converted layout with the altered switching. Also just noticed IC3's unused opamp is floating around. I suppose the output and - should be connected and the + to 7.5, unless someone else says otherwise. Damn you space taking things. 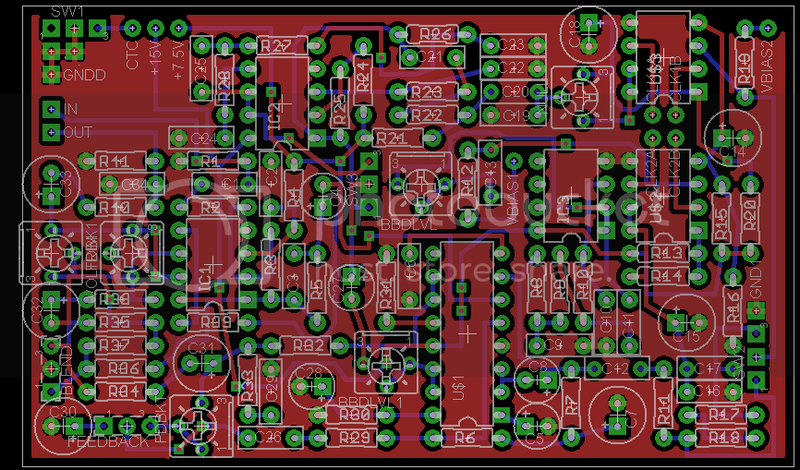 sodapep2 wrote: I haven't moved the values from Nelson's schematic to mine yet, so I haven't posted, but it is the MN3007 converted layout with the altered switching. Also just noticed IC3's unused opamp is floating around. I suppose the output and - should be connected and the + to 7.5, unless someone else says otherwise. Damn you space taking things. 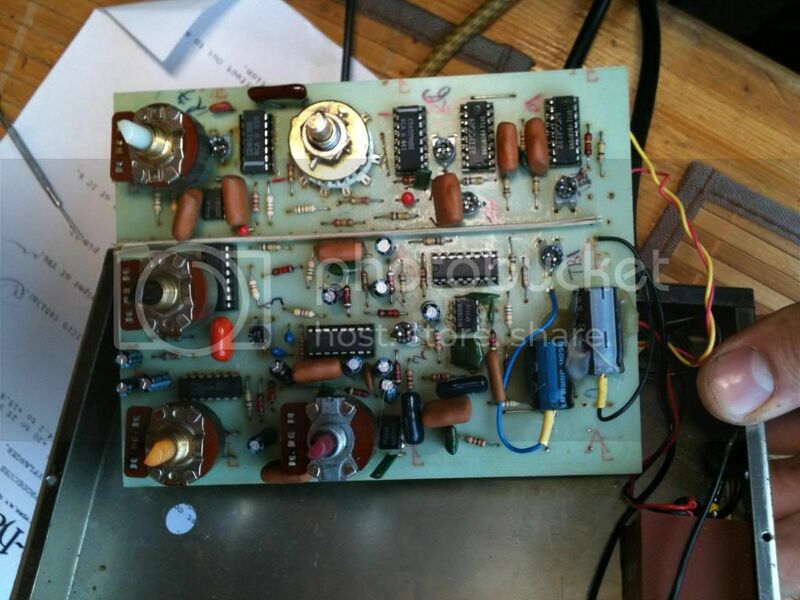 How have you ended up with half an unused opamp? Oops, can't edit, see where you were going now, I was looking at the old version. Yes you have that right. Anyone for an all in one? Need to work on the silkscreen a little, but thar she blows. Would be sick with the DMM I'm working on.